45 mm polished and satin-finished titanium case, polished and satin-finished titanium bezel, sapphire crystal with anti-reflective treatment, mat black dial, HUB 1112 self-winding movement, approximately 42 hours of power reserve, satin-finished and polished titanium bracelet, titanium deployant buckle. Water resistant to 50 m.
45 mm satin-finished and polished titanium case, satin-finished and polished titanium bezel with 6 H-shaped titanium screws, sapphire crystal with anti-reflective treatment, blue sunray dial, HUB 1112 self-winding movement, approximately 42 hours of power reserve, satin-finished and polished titanium bracelet, titanium deployant buckle. Water resistant to 50 meters. 45 mm satin-finished and polished titanium case, satin-finished and polished titanium bezel with 6 H-shaped titanium screws, sapphire crystal with anti-reflective treatment, verdigris bronze dial with green and gilt marbling, HUB 1100 self-winding movement, approximately 42 hours of power reserve, black rubber and vintage brown calf strap with brown stitching, stainless steel deployant buckle. Water resistant to 50 meters. 45mm titanium case, sapphire crystal back, titanium bezel, black composite resin lateral inserts and bezel lugs, mat black dial, self winding HUB 1112 movement, approximately 42 hours of power reserve, black rubber and alligator strap with deployant buckle. Water resistant to 50 meters. 45mm titanium case, sapphire crystal back, titanium bezel set with 126 diamonds (1.60ct), black composite resin lateral inserts and bezel lugs, mat black dial, self winding HUB 1112 movement, approximately 42 hours of power reserve, black rubber and alligator strap with deployant buckle. Water resistant to 50 meters. 45mm titanium case set with 208 diamonds (1.75ct), sapphire crystal back, titanium bezel set with 126 diamonds (1.60ct), black composite resin lateral inserts and bezel lugs, mat black dial, self winding HUB 1112 movement, approximately 42 hours of power reserve, black rubber and alligator strap with deployant buckle. Water resistant to 50 meters. 45mm titanium case, sapphire crystal back, titanium bezel, black composite resin lateral inserts and bezel lugs, mat black dial, self winding HUB 1112 movement, approximately 42 hours of power reserve, titanium bracelet. Water resistant to 50 meters. 45mm titanium case, titanium bezel, black dial, self winding HUB 1112 movement, black rubber strap with deployant buckle. Water resistant to 100 meters. 45mm polished and satin-finished titanium case, vertical satin-finished titanium bezel with 6 h-shaped titanium screws, sapphire crystal with anti-reflective treatment, mat black dial with satin-finished rhodium-plated appliques and polished rhodium-plated hands, HUB 1112 self-winding movement, approximately 42 hours of power reserve, black alligator strap, stainless steel deployant buckle. Water resistant to 50 m.
45mm polished and satin-finished titanium case, vertical satin-finished titanium bezel with 6 h-shaped titanium screws, sapphire crystal with anti-reflective treatment, mat black dial with satin-finished rhodium-plated appliques and polished rhodium-plated hands, HUB 1112 self-winding movement, approximately 42 hours of power reserve, black lined rubber strap, stainless steel deployant buckle. Water resistant to 50 m.
45 mm satin-finished and polished titanium case, satin-finished and polished titanium bezel with 6 H-shaped titanium screws, sapphire crystal with anti-reflective treatment, opalin dial with satin-finished rhodium-plated appliques and polished rhodium-plated hands, HUB 1112 self-winding movement, approximately 42 hours of power reserve, black rubber and alligator strap, stainless steel deployant buckle. Water resistant to 50 meters. 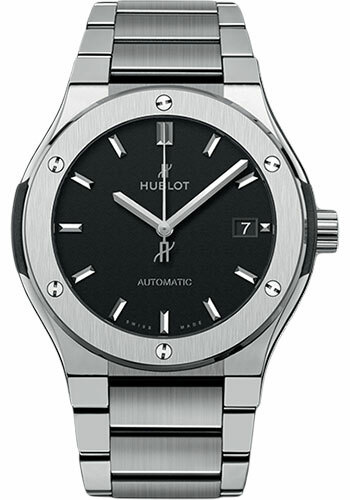 45 mm polished and satin-finished titanium case, polished and satin-finished titanium bezel, sapphire crystal with anti-reflective treatment, grey sunray satin-finished dial, HUB 1112 self-winding movement, approximately 42 hours of power reserve, black and grey rubber and alligator strap, stainless steel deployant buckle. Water resistant to 50 m.
45 mm polished and satin finished titanium case, polished and satin-finished titanium bezel with 6 H-shaped titanium screws, sapphire crystal with anti-reflective treatment, blue sunray dial with polished rhodium-plated appliques and hands, HUB1112 self-winding movement, approximately 42 hours of power reserve, blue rubber and alligator strap, stainless steel deployant buckle. Water resistant to 50 meters. 45 mm satin-finished and polished titanium case, satin-finished and polished titanium bezel with 6 H-shaped titanium screws, sapphire crystal with anti-reflective treatment, satin-finished green sunray dial, HUB1112 self-winding movement with movement, approximately 42 hours of power reserve, black rubber and green alligator strap, stainless steel deployant buckle. Water resistant to 50 meters. 42 mm polished and satin-finished titanium case, polished and satin-finished titanium bezel with 6 h-shaped titanium screws, sapphire crystal with anti-reflective treatment, sapphire dial, HUB 1131 self-winding movement, approximately 42 hours of power reserve, black alligator strap, stainless steel deployant buckle. Water resistant to 50 m.